Many healthcare providers are giving more attention to their patients' well-being by focusing on the "whole person." A crucial component of this holistic view of patient care is positioning providers as people who lead by example and thrive in their own well-being. After all, how well can medical professionals influence positive lifestyle habits in their patients if they're not embracing healthy habits themselves? The problem is, the very workers who are treating patients can sometimes be left out of the well-being equation. Though a great deal of attention is geared toward patients' well-being, healthcare workers often have limited means to engage in well-being practices of their own. This is particularly worrisome as healthcare employees' well-being can affect a healthcare organization's ability to provide the best and safest patient care. 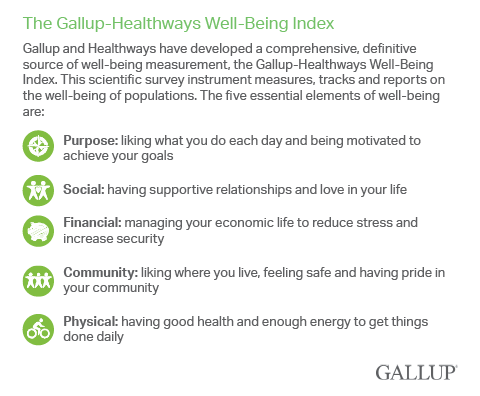 Gallup and Healthways have developed a comprehensive, research-based definition of well-being and how it relates to employees, business outcomes and living a fulfilled life. This definition encompasses five interrelated and essential elements: purpose, social, financial, community and physical. Together, these elements provide key insights into individuals' sense of purpose, social relationships, financial security, relationship to their community and physical health. 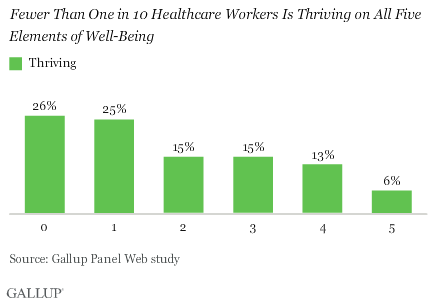 Gallup and Healthways research shows that more than half of all healthcare workers are thriving in none or only one element of well-being, rather than thriving in multiple elements. But this also means that there is a significant opportunity for their well-being to improve. 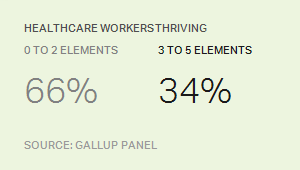 A more positive finding is that one in three healthcare workers (34%) is thriving in three or more well-being elements. The field of medicine can be quite stressful, as it's both emotionally demanding and logistically rigorous, which can be a recipe for burnout. The 24/7 nature of the job -- constantly being "on," with always more to do -- and regulatory and compliance tasks can create a heavy and sometimes burdensome workload for many healthcare professionals. Healthcare workers are notorious for neglecting their own care and not taking time for their own well-being. That's why a "care for the healthcare worker" approach is essential within healthcare organizations to give workers the energy, focus and adaptability they need to come to work ready to be their best every day. In fact, healthcare workers with high well-being are more likely to be resilient and recover quickly from stress, important qualities to possess when overseeing the lives and welfare of others. Whether a healthcare organization approaches well-being to improve its employee engagement, retain talent or meet its mission to create a healthier community, well-being drives significant business outcomes. Healthcare workers who are thriving in three or more elements are more likely to be at work every day, because they have fewer unhealthy days that prevent them from doing their usual activities than do those with lower well-being. Furthermore, high well-being supports mental health and resiliency. 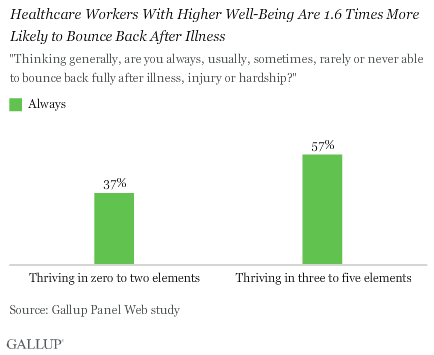 Healthcare workers who are thriving in three or more well-being elements are more likely to report bouncing back quickly from illness, injury or hardship than those who are not. 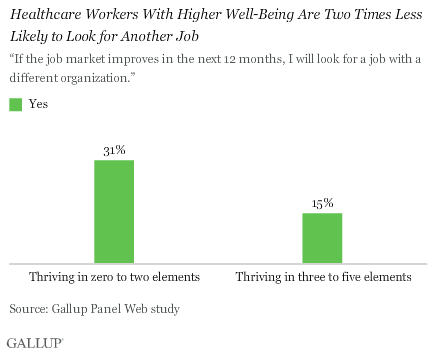 Medical professionals who are thriving in three or more elements are also two times less likely to look for a new job than their counterparts with lower well-being. Both of these findings are significant, because attendance and retention are crucial components of proper patient care, patient satisfaction, correct staffing coverage and reduced expenses. Improving healthcare workers' well-being requires more than simply improving physical health. Healthcare workers who don't feel connected to their community or who are struggling with debt may find it difficult to focus on their patients or model healthy behaviors to them while they are at work. When healthcare workers thrive in all elements of well-being, not just physical, healthcare organizations can gain a competitive advantage from employees' maximized performance, reduced turnover and enhanced engagement. Establishing a culture that promotes well-being by focusing on all five elements will help healthcare workers thrive -- and this, in turn, will benefit patients and the community. Sangeeta Agrawal contributed to the research in this story. Results are based on a Gallup Panel Web study completed by 24,320 national adults, aged 18 and older, conducted Oct. 8-Nov. 13, 2014. A subsample of 1,300 healthcare working adults was selected for this analysis. The Gallup Panel is a probability-based longitudinal panel of U.S. adults who are selected using random-digit-dial (RDD) phone interviews that cover landline and cellphones. Address-based sampling methods are also used to recruit panel members. The Gallup Panel is not an opt-in panel, and members are not given incentives for participating. The sample for this study was weighted to be demographically representative of the U.S. adult population using 2013 Current Population Survey figures. For results based on this sample, one can say that the maximum margin of sampling error is ±3 percentage points, at the 95% confidence level. Margins of error are higher for subsamples. In addition to sampling error, question wording and practical difficulties in conducting surveys can introduce error and bias into the findings of public opinion polls. Jade Wood is Well-Being Practice Manager at Gallup. Rebecca Riffkin is a Writer and Analyst at Gallup. Barely one-quarter of employees participate in such programs. Experts discuss how companies can fix this problem. When a company builds a culture of well-being, employee engagement will accelerate and customers will see the impact.